“CareSet is honored to be granted unprecedented access to this critical dataset.” says Data Journalist Fred Trotter, CTO of CareSet Systems. 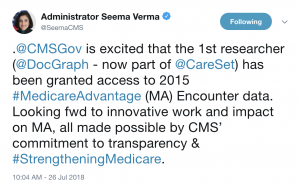 “For the first time, the marketplace will have transparent insight into what healthcare looks like when it is administered by private plans.” CareSet Labs releases CMS data as public use files for researchers and commercial organizations as the DocGraph Datasets (https://careset.com/datasets/). If you are a Life Science or Bio-Tech company contact CareSet for help applying this new data resource to your environment. CMS’ commitment to transparency has paved the way for continued innovation and research. Trotter confirms “this action is a promise kept by the current administration” and a “win for open data initiatives in healthcare”. Using this dataset, CareSet will be able to compare treatment patterns between Part C and traditional-fee-for-service Medicare, as well as gain an understanding into how commercial plans operate from a claims perspective.